While everyone is “high fiving” over stocks holding up, the bond market is back to imploding. Already Treasury yields have bounced and are soaring higher in one of the nastiest breakouts in over 20 years. In a world awash in too much debt (global Debt to GDP is over 300%) this is a MAJOR problem. Most investors believe that the 2008 Crisis was the worst crisis of their lifetimes. 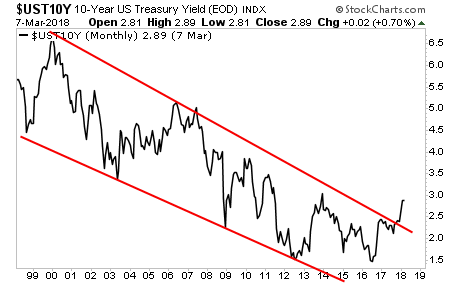 They’re mistaken… what’s coming down the pike when the Bond Bubble blows up will be many times worse than 2008. The reason is that bonds, not stocks, represent the bedrock of the financial system. When a stock bubble bursts, investors lose money. When a sovereign bond bubble bursts, entire countries go bust (a la Greece in 2010). 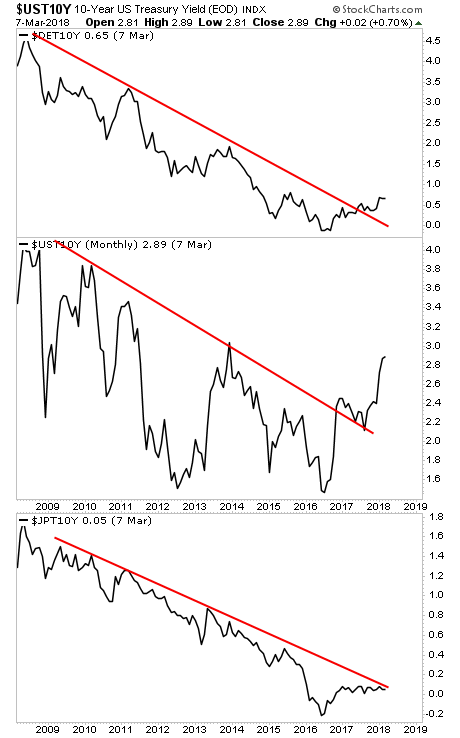 On that note, I want to point out that bond yields are not just rising in the US... we're seeing them spike in Germany, Japan, and others. This is a truly global problem, and if Central Banks don't move to get it control soon, we're heading into a MAJOR crisis.